Not only are time-tested supplements making a comeback, time-tested techniques are as well. 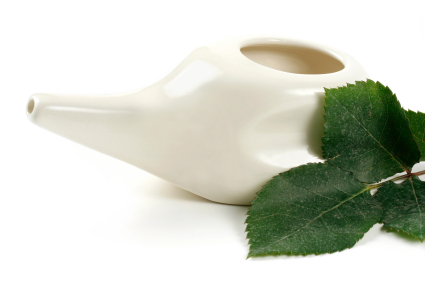 Neti is a very simple technique for cleansing the nasal and sinus passages, which has many benefits for women’s health. Today, if you haven’t yet noticed, there is a wonderful trend occurring in the field of health and nutrition. Prevention is actually being emphasized over just treating symptoms with drugs. You have probably been plagued by many ‘colds’ in your lifetime, and experienced your children or spouse suffering the same. The common treatment was to get a cold and sinus drug, take it, and let it chemically open your sinus and nasal passages, which it will do temporarily, giving you temporary relief. When it wears off, the only thing you can do to get that same relief is take it again. They also usually have ingredients that will help you sleep, making you drowsy. It’s not to say that these medications don’t have their place. When you need to feel better right now, they are very helpful. Why not, however, look at a natural technique for improving nasal function, and explore how it can benefit this area of women’s health? You may already have some preventative measures in place during cold and flu or allergy season. Probably you make sure to stay hydrated, take adequate vitamin C to boost your immunity, and so on. The other simple technique you can put in place is that of neti. Neti is the ancient yogic practice of irrigating the nasal passages and sinuses. It is very simple. Using a neti pot, you pour saline solution into one nostril while blocking the nasal connection to the mouth (this is done by starting the make the ‘k’ sound). The solution will come out of the other nostril. You then repeat the procedure on the other side. This simple practice effectively cleans and moisturizes the nasal passages, and cleans the sinuses through a vacuum effect. Water does not go into the sinus cavities, but as it passes by, a vacuum effect is created, pulling mucous out. The practice of neti is reported to reduce nasal congestion, cleanse the sinus cavities of allergens and irritants, treat chronic sinusitis, prevent common colds and the flu, relieve nasal dryness, improve breathing, and reduce coughing and other symptoms of post-nasal drip. Not bad for a daily practice that just takes a few minutes! If you suffer from sinus-related conditions, or if you just want to ‘breathe easier’ during allergy season, cold season and throughout the year, try implementing the neti technique for improved women’s health.